HOUSED in a jumble of ancient buildings in the shadow of Westminster Abbey, Westminster School has been educating boys since it was founded in 1560 by Queen Elizabeth I to provide lessons for 40 poor scholars. 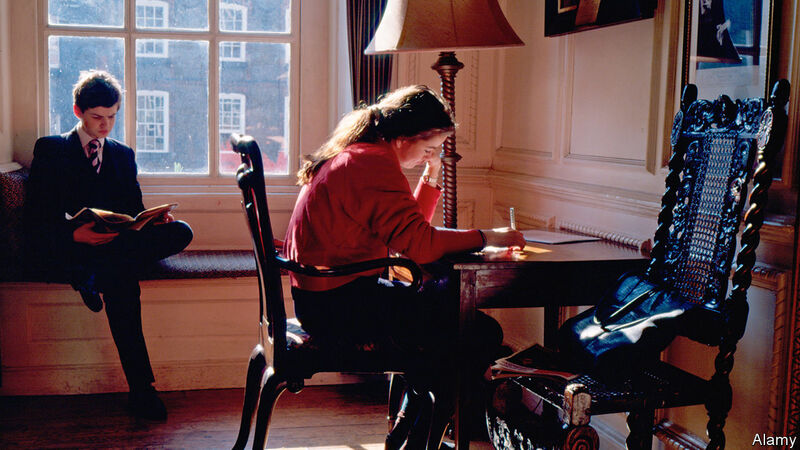 It has evolved since then—its 750 pupils now include some girls, and with fees of £39,252 a year for boarders and £27,174 for day pupils, poor scholars are thin on the ground—but for nearly half a millennium, these historical premises defined its geographical limits. That is about to change. A ground-breaking ceremony on April 9th marked the start of the construction of Westminster Chengdu, the first stage in a venture with a local partner, Hong Kong Melodious Education Technology Group. The school is due to open in September 2020 and will have 2,500 pupils from the ages of 3 to 18. It will be followed by a further five establishments of a similar size in other Chinese cities over the next ten years, by the end of which Westminster will be educating 20 times as many children in China as in the heart of London. A slice of the Chinese operation’s income will flow back to the mother ship, enabling Westminster to increase the share of pupils on bursaries in Britain from around 5% to 20%. “It will give us a revenue stream that will allow us to go back to our roots,” says Rodney Harris, deputy headmaster in London, who is moving to Chengdu in September to take the top job there. By extending its model to China, the school thus hopes to mitigate the inequality to which it contributes in Britain. Education used to be provided by entrepreneurs and religious organisations, but starting in Prussia in the 18th century, governments began to take over. In more recent years the state has dominated education in the rich world, with the private sector restricted to the elite and the pious. In the developing world, too, new states created from crumbling empires were keen to provide (and control) education, both to respond to their people’s ambitions and to shape the minds of the next generation. But now the private sector is enjoying a resurgence. Enrolment in private schools has risen globally over the past 15 years, from 10-17% at primary level and from 19-27% at secondary level; the increases are happening not so much in the rich world as in low- and middle-income countries. People are pouring money into schooling, tuition and higher education (see chart). Four factors are driving the increase. First, incomes are rising, especially among the better-off. Since birth rates are falling, the amount of money available for each child is rising even faster than incomes. In China the one-child policy has meant that in many families six people (four grandparents and two parents) are prepared to invest in the education of a single child. Second, thanks to the relative decline and increasing capital intensity of manufacturing, job opportunities for the less well-educated are shrinking. Even good factory jobs require qualifications. The returns to education have risen despite the rise in the supply of well-educated people. In developing countries, which have fewer of them, the returns are higher than in the rich world, making it even more important for young people there to go to school. Third, the output of education also provides some of the input: the more children that are educated, the more teachers will be available to bring on the next lot. This is especially true in countries in which job opportunities for women are limited: lots of educated women translate into a ready supply of cheap teachers. Fourth, technology is creating a demand for new skills which the private sector seems better at providing. It is also opening up new markets as the internet enables people to get educated in different ways and at different times in their lives. The dividing line between private and public is often unclear—many countries have government schools that are partly privately financed, for instance, and private schools that are publicly financed—and the size and growth of the private sector varies from country to country. 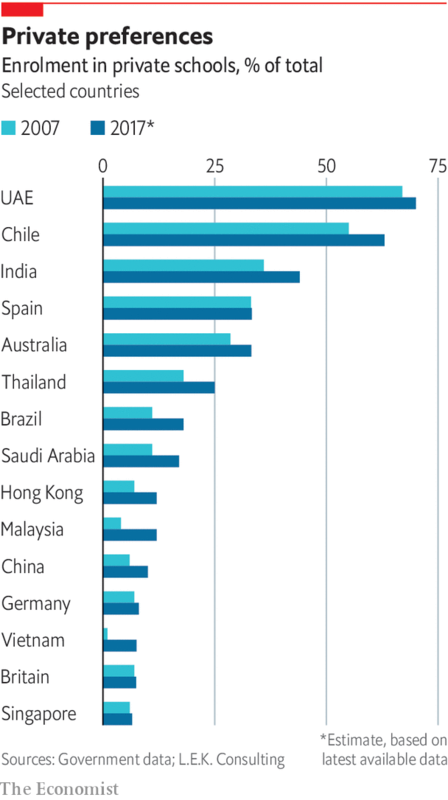 Broadly, the more developed the country, the smaller the private sector’s role tends to be. In Haiti about 80% of primary-school pupils are being educated privately; in Germany, just 5%. In mainland Europe, the quality of state education is generally high, so the private sector tends to play a smallish role—though there are wrinkles. For example, a history of religious divisions in the Netherlands has meant that three-quarters of pupils go to private schools, the great majority of them publicly financed; in Sweden, 10% do. In America and Britain the quality of government schools is variable, which explains sizeable elite private sectors and a growing number of privately managed, publicly funded schools—“charters” in America, “academies” in Britain. In the tertiary sector, private institutions have a big role in America, both at the top and the bottom of the market; in Britain, the tertiary sector is now largely privately financed. In Latin America the Catholic church’s big role in schooling, the low quality of state provision and the rapid growth in demand for tertiary education have all contributed to a big role for the private sector. In much of South Asia and Africa, poverty, migration and population growth make it hard for governments to provide schooling in many cities, so the private sector is big, and growing fast. The elites have already left the public systems, and many middle-class and poorer people are following. Like Europe, East Asia has generous and mostly good state provision, but unlike Europe it also has a fast-growing private sector. Vietnam has both the best state-school system in a low-income country and probably the world’s fastest-growing private-school sector. 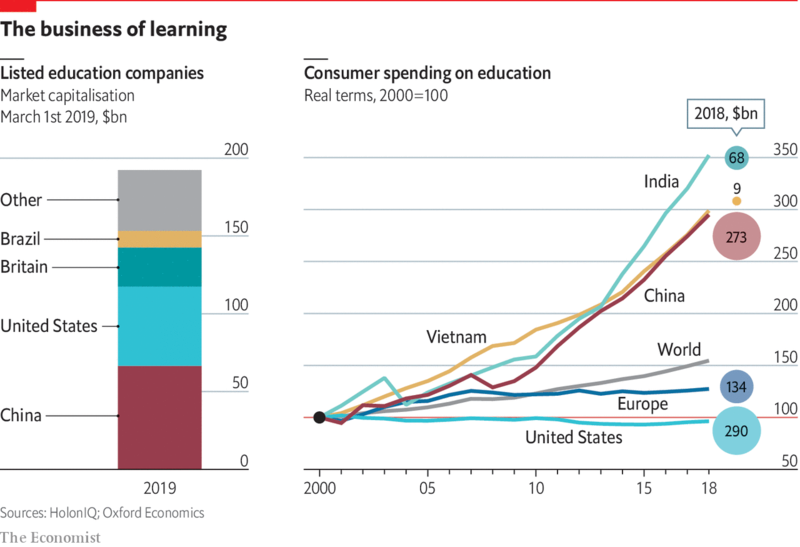 The market capitalisation of Chinese education companies, bigger than those of any other country, suggests that investors see it as a golden opportunity. The Chinese state is clamping down on the private sector’s role between the ages of 6 and 16, but there is still room for growth. If the child goes to a private nursery and a private university, and receives two hours of private tuition on each school day and eight at the weekends, with a summer maths camp thrown in—a fairly standard routine for a child of Chinese professionals—he or she will spend as much time in the private as in the state sector. All of this makes education attractive to investors, says Ashwin Assomull of L.E.K. Consulting. Demand is growing faster than incomes and holds up well in economic downturns. Technology is creating new markets. Schooling is fragmented, but there are large and growing chains, such as GEMS Education, a Dubai-based company with 47 schools mostly in the Middle East; Cognita, a British company with 73 schools in eight countries; and Beaconhouse School Systems, a Pakistani company with 200 schools in seven countries. The main downside is the sector’s political sensitivity. Private investment in education makes governments uncomfortable because it pits a private good against a social one. Governments, like parents, want children to learn, but they also want to maximise social mobility and minimise inequality, whereas parents simply want to ensure that their children do better than anyone else’s. These objectives inevitably conflict, so governments regulate and restrict the private sector, controlling what is taught, banning profits, outlawing selection, cutting fees and generally making the business unattractive to investors. Yet they need it, too, so they work with it, channelling its skills, inventiveness and capital and pouring taxpayers’ money into it. This special report will consider what the private sector is providing that the state is not, and look at the costs and benefits of its growth. It will examine how well it is performing, and conclude by asking how the private sector and the state can work together to best effect. Is the equity bull market too big to fail? The US equity market is on another streak, posting a double-digit gain since the start of the year and extending a bull run that has lasted 10 years. In terms of pure numbers, equities occupy a position far above any other asset, and in everyday life stocks have jumped ahead of real estate as a store of wealth for Americans. From a risk management perspective, policymakers should consider broadening the definition of “too big to fail” to include market segments and not just financial groups since, at various times, the main risks to the economy and financial system have been the high value of assets on the private sector’s balance sheets. The power and influence of equities should not only be assessed by the numbers, but also by how the market has become part of daily public and political conversation as well as a driver and verification of policy. At today’s prices, the market value of publicly traded equities is estimated to be about $33tn, not far off the record high of $36tn recorded in the third quarter of 2018. Measured in relation to nominal GDP, the market value of equities stands at about 1.6 times. The record high of 1.7 times was reached twice before, in Q3 2018 and Q1 2000. Household holdings of equities, both directly and indirectly held, stand at almost $30tn, and represent the highest valued asset on household balance sheets. Equities account for 33 per cent of total household financial assets, topped only by the 37 per cent share recorded in 2000. Equities have exceeded the market value of real estate on household’s balance sheets for six consecutive years. The only other time equities exceeded real estate was in 1998-1999, which came on the heels of five consecutive years of 20 per cent to 30 per cent gains in the equity market. News on the equity market dominates the airwaves. Today there are several financial markets shows dedicated to stocks, and even news TV broadcasts post an equity ticker showing how the market is faring. Updates on the equity markets are as frequent and as common as weather reports. The equity market has become an important driver of consumer and business confidence and is often viewed as the single most important “real time” barometer of current and future economic conditions. Monetary policymakers often look at the equity market for a validation of their views on the economy and policy stance. 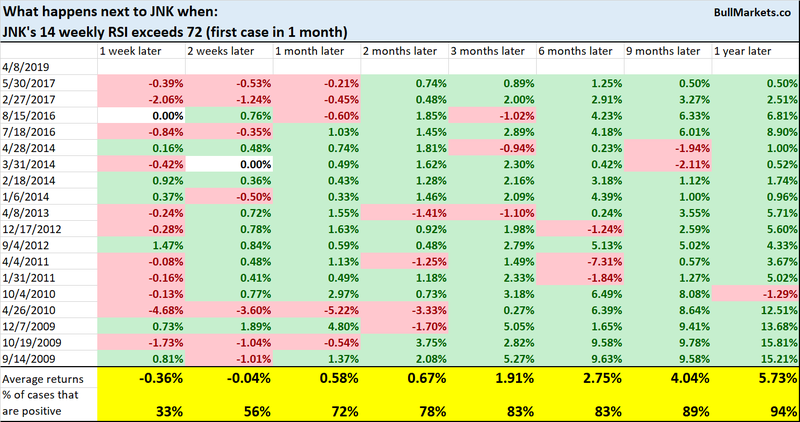 Many analysts think the recent pivot by the US Federal Reserve to pause from further rates hikes was directly linked to the near 20 per cent sell-off in equities in the fourth quarter of 2018. And political leaders such as President Donald Trump have been pointing to the stock market as a barometer of the success or failure of their policies and even their leadership. 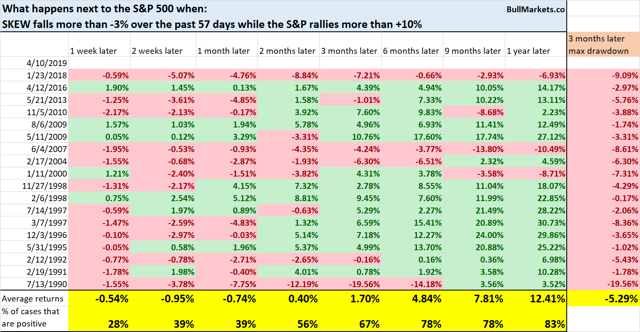 None of this suggests a correction in the equity market any time soon, but it does illustrate how it has risen to a level of financial, economic, public and political importance never seen before. That raises the natural question: “Is the equity market too big to fail?” That clearly was a valid issue back in the late 2000s when the housing market — a key driver of growth and liquidity — crashed, triggering widespread damage to the economy and financial market. When it comes to the equity market, that question can only be answered in hindsight, but after 10 years of gains risks are rising, especially since recent gains appear to be linked to the promise of easy money and not stronger corporate earnings. Policymakers have consistently argued that it is impossible to identify asset bubbles and the best defence against them is robust supervisory and regulatory oversight. That policy does not work in practice when the risks sit on the balance sheets of the private sector and easy money is part of the problem. At today’s levels, the equity market is too big to fail without causing substantial damage to the economy that would be far greater than what happened after the tech bubble burst in 2000, since policymakers have far less capacity to reduce interest rates and real estate is unlikely to provide the same buffer for investors or the economy. 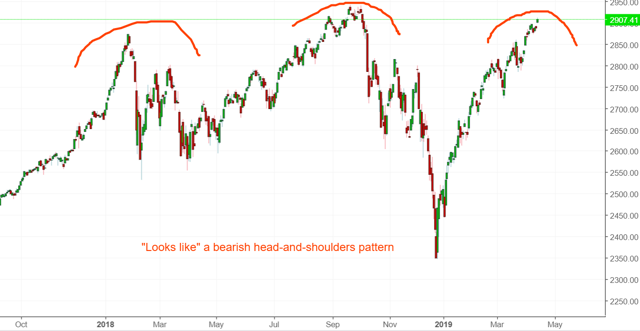 Market Outlook: Is The Stock Market Making A Head And Shoulders? - As the stock market approaches all-time highs, some traders and investors are wondering if the stock market is making a head and shoulders pattern. - The problem with these patterns is that they are only obvious with 20/20 hindsight. These patterns have too many false signs. - In this article we examine the medium term bullish and short term bearish case for stocks. The stock market’s relentless rally continues. The S&P 500 (excluding dividends) is just 1% from a new all-time high, while the S&P 500 Total Return Index (including dividends) is already at an all-time high. While the chart may “look like” a bearish head-and-shoulders pattern, these patterns are only clear with the benefit of 20/20 hindsight. Too many potential head-and-shoulders patterns don’t work out in real-time (i.e. false bearish signals). And by the time you wait for a “bearish confirmation” break of the neckline, the S&P is already down -20%. The stock market’s long term risk:reward is no longer bullish. The medium term direction (e.g. 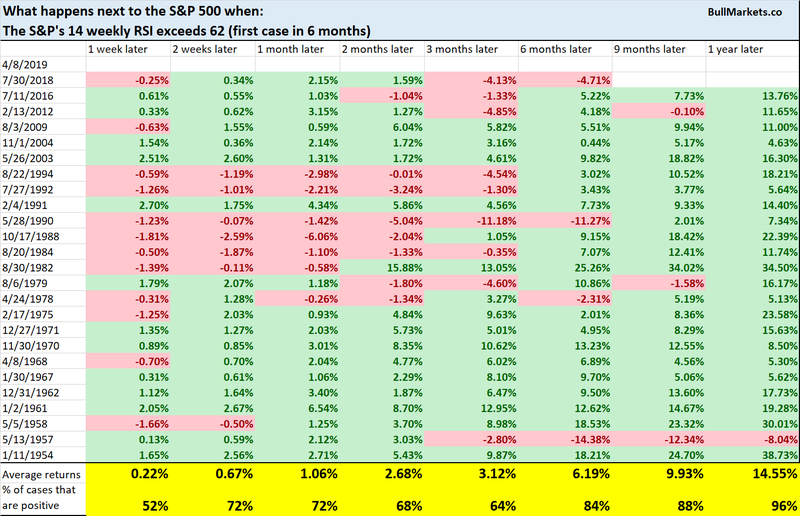 next 6-9 months) is mostly mixed, although there is a bullish lean. We focus on the long term and the medium term. While the bull market could keep going on, the long term risk:reward no longer favors bulls. The labor market starts to deteriorate. Meanwhile, the U.S. stock market is in a long term topping process. The labor markets have not deteriorated significantly yet. Initial Claims is trending sideways/downwards while Continued Claims is trending sideways. In the past, these 2 figures trended higher before bear markets and recessions began. You don’t need to be worried about the most recent drop in Job Openings. Month-to-month changes in economic data are notoriously noisy, which is why we focus on the trend. 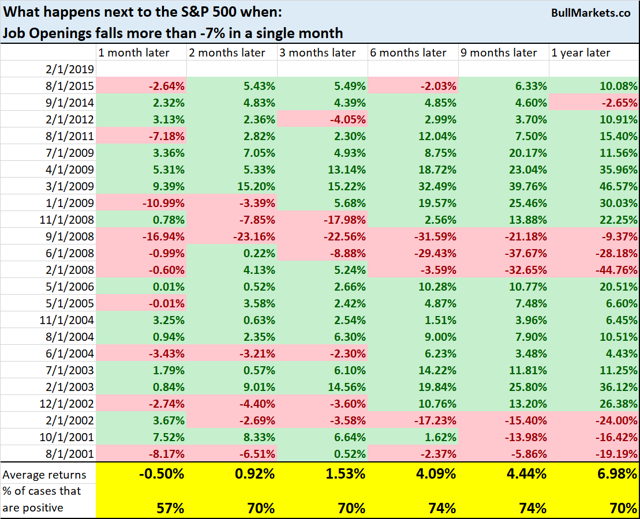 Here’s what happens next to the S&P when Job Openings falls more than -7% in a single month. Heavy Truck Sales is mostly trending sideways right now. The key point is that Heavy Truck Sales has not trended downwards. In the past, Heavy Truck Sales trended downwards before bear markets and recessions began. Inflation-adjusted New Orders for Consumer Goods is still trending sideways/upwards. In the past, inflation-adjusted New Orders trended downwards before bear markets and economic recessions began. In a credit-driven economy, the Credit Subindex is most important. You can see that the Credit Subindex is still very low. This is not a long term bearish factor for the stock market right now because historically, financial conditions tightened significantly before bear markets and recessions started. Inflation-adjusted Retail Sales are no longer trending upwards. This is a necessary-but-not-sufficient condition for bear markets and economic recessions. The stock market’s valuations are still extremely high, no matter what valuation indicator you use. Valuations are not timing indicators. Shiller P/E consistently peaked at approximately 22 from 1900 – 1994. But from 1994 – present, valuations have been consistently higher. 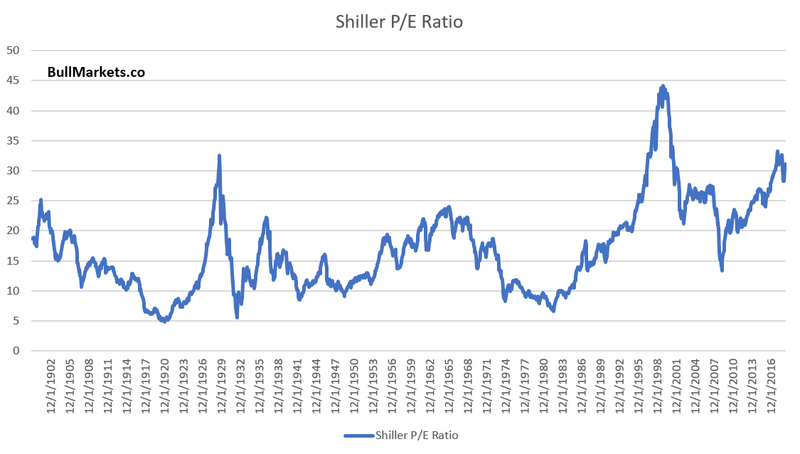 Here’s what happens when you sell the S&P when Shiller P/E reaches to 22. As you can see, a strategy that worked pre-1994 no longer works post-1994. 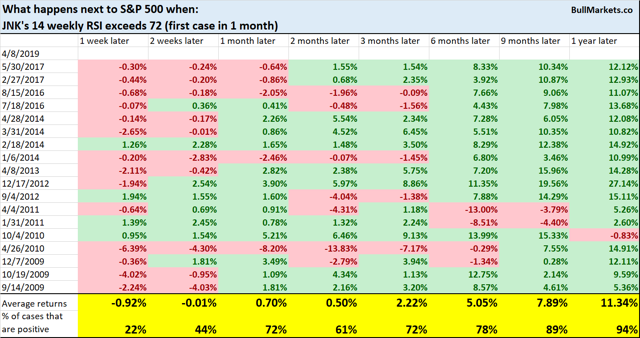 Conclusion: The stock market’s biggest long term problem right now is that as the economy reaches “as good as it gets” and stops improving, the long term risk is to the downside. The end of a bull market is always very tricky to trade. The stock market can go up a lot in its final year, even if the macro economy is deteriorating (e.g. 2006-2007). That’s why it’s better to focus on long term risk:reward instead of trying to time exact tops and bottoms. Even when you think the top is in, the stock market could very well surge for 1 more year. (Just ask the people who thought that the dot-com bubble would end in 1998. It lasted another 1.5 years). *For reference, here’s the random probability of the U.S. stock market going up on any given day, week, or month. The stock market’s price action demonstrates a bullish lean over the next 6-12 months. The S&P 500 is within 1% of new all-time highs while the S&P 500 Total Return Index is already at new all time highs. 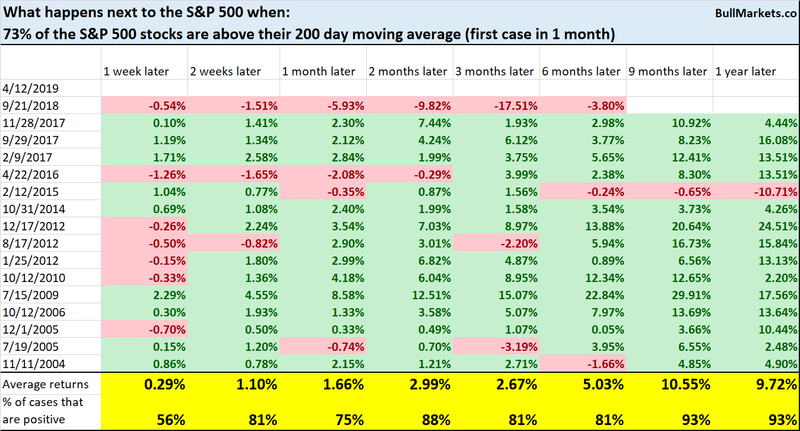 This is a very fast reversal, since the stock market was crashing less than 4 months ago. 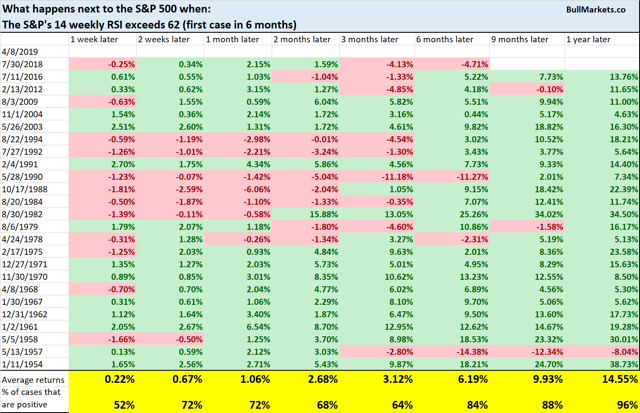 Historically, such quick reversals were more bullish than bearish 3-12 months later. 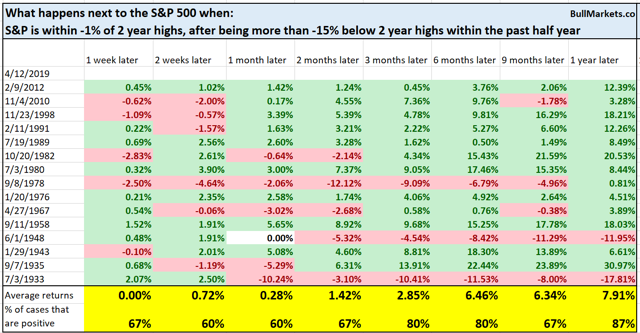 Here’s what happens next to the S&P 500 when the Zahorchak Method goes from -10 to +6 within the past 6 months. Breadth continues to improve as the stock market relentlessly pushes higher. 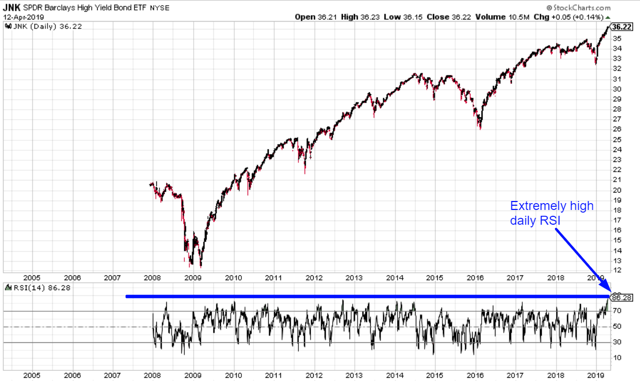 Here’s the S&P 500 Bullish Percent Index, which saw weaker breadth in the 2000-2002 and 2007-2009 bear market rallies. Here’s what happens next to the S&P when the Bullish Percent Index reaches 79 for the first time in 3 months. Meanwhile, 73% of the S&P 500’s stocks are above their 200 dma. You can see that this didn’t happen during 2008’s bear market rallies. *Be careful when using indicators with limited history. They tend to be misleading. E.g. you have no idea how this indicator performed in the 2000-2002 bear market, 1973-1974 bear market, 1969-1970 bear market. The S&P’s 14 weekly RSI (momentum indicator) is now at 62. Historical bear market rallies usually did not see such strong momentum. Small caps continue to significantly lag large caps and tech. Small caps’ underperformance occurred at the top of the 2000 dot-com bubble, but also occurred in other less ominous historical cases. While the stock market has rallied significantly over the past 3.5 months, corporate bond spreads have not narrowed significantly. 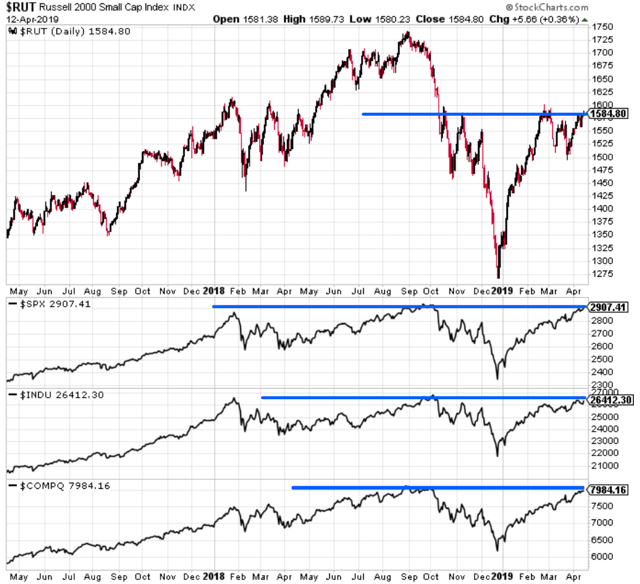 This divergence is not as long term bearish as you think. The stock market’s short term outlook leans bearish. However, the short term is extremely hard to predict, no matter how much conviction you think you have. That’s why we focus on the medium-long term. As of Wednesday, the Russell 2000 fluctuated above and below its 200 dma 7 times in the past 50 days. This reflects some indecision in the stock market. Historically, this was a short term bearish factor for the stock market 1 month later. SKEW is often viewed as a black swan indicator. As it rises, the potential risk in financial markets rises. It tends to move mostly inline with the S&P. 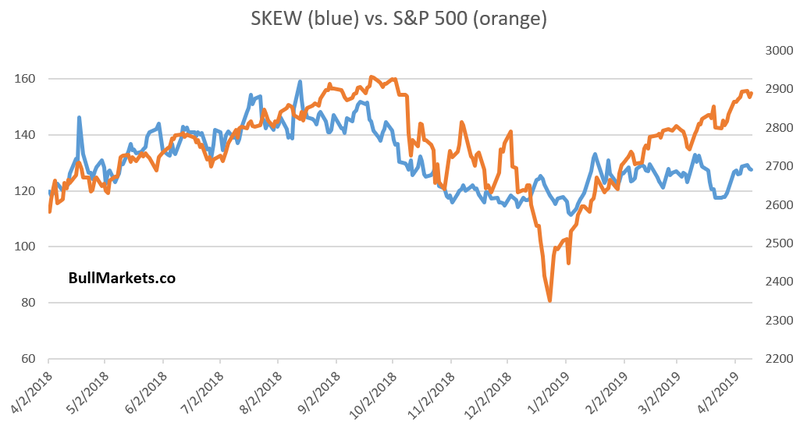 You can see that SKEW has diverged from the S&P 500 since January 2019. This is a short term bearish factor for stocks. Junk bonds are on fire, recording one of the highest daily and weekly RSI readings in JNK’s short history. 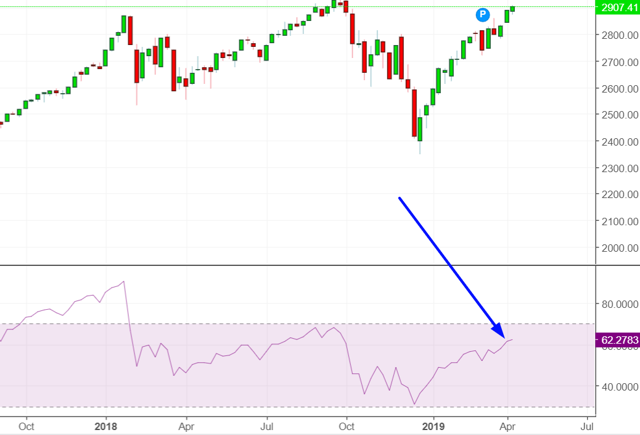 Here’s what happen next when JNK’s 14 weekly RSI exceeds 72 (i.e. overbought). 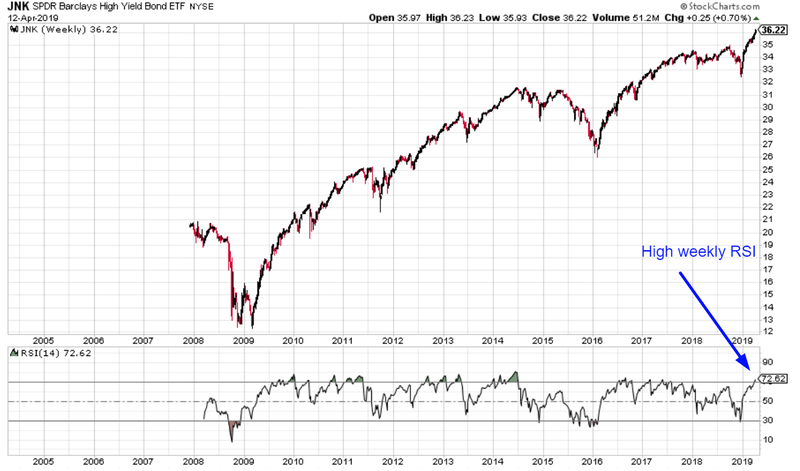 As you can see, this is a short term bearish factor for stocks and junk bonds. *Don’t take the “up 94% of the time 1 year later” too seriously. The historical data is limited to only a bull market, so of course the 1 year forward returns would be ridiculously bullish. The U.S. stock market’s long term risk:reward is no longer bullish. In a most optimistic scenario, the bull market probably has 1 year left. Long term risk:reward is more important than trying to predict exact tops and bottoms. We don’t predict the short term because the short term is always extremely random. At the moment, the short term does seem to have a slight bearish lean. 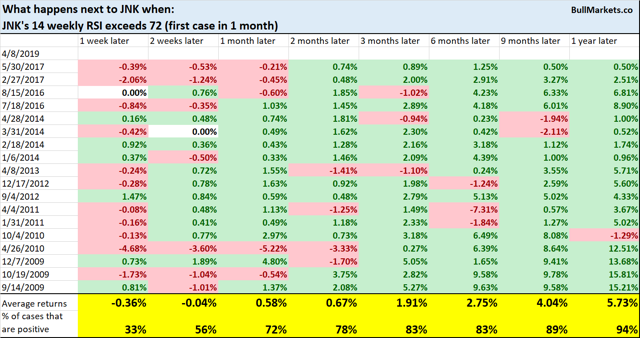 In summary, 12-24 months = bearish, 12 months = neutral, 6-9 months = slightly bullish. Goldman Sachs’ Bull/Bear Indicator demonstrates that risk: reward does favor long term bears. U.S. Debt: Is It the Calm Before the Storm? Wharton's Joao Gomes and George Washington University's Tara Sinclair discuss the nation's long-term debt burden and what might be done about it. The U.S. national debt has crossed $22 trillion — the highest ever. In the first four months of the 2019 fiscal year (October 2018-January 2019), the federal budget deficit ballooned to $310 billion, up 77% from the same time last year, as revenues fell 2% to $1.1 trillion and spending rose 9% to $1.4 trillion, according to a Treasury department report. That has been a trend building over the past year. In calendar 2018, the budget deficit grew to $873 billion, 28% over that of 2017. The culprit was lower tax revenues after the passage of the 2017 Tax Cuts and Jobs Act, a senior Treasury department official told The Wall Street Journal in January. That picture will worsen, the nonpartisan Congressional Budget Office (CBO) warned, projecting that the U.S. would add another $12.2 trillion in debt over the next decade to reach levels not seen since World War II in the 1940s. The biggest worry with the soaring federal debt is whether the government will be able to find the money for Social Security and Medicare benefits for retirees in the years to come “That’s why the CBO keeps putting out these reports where they’re trying to ring the warning bells,” said Sinclair. What is also not immediately apparent is the how the “demographic time bomb” of fewer younger-age workers funding benefits for retirees will work out. “The real elephant in the room … is how affordable that will be” at the rates at which the government is currently borrowing, Gomes said. According to Sinclair, funding for Social Security is “a fairly easy one to fix.” She listed some of the options: People could be asked to work a few more years instead of retiring at 62, 65 or even 70. Also, inflation rates could be contained at lower levels so that the pressure is less on paying out inflation-adjusted benefits. The more difficult issue to resolve is funding for Medicare if the federal debt goes out of control. 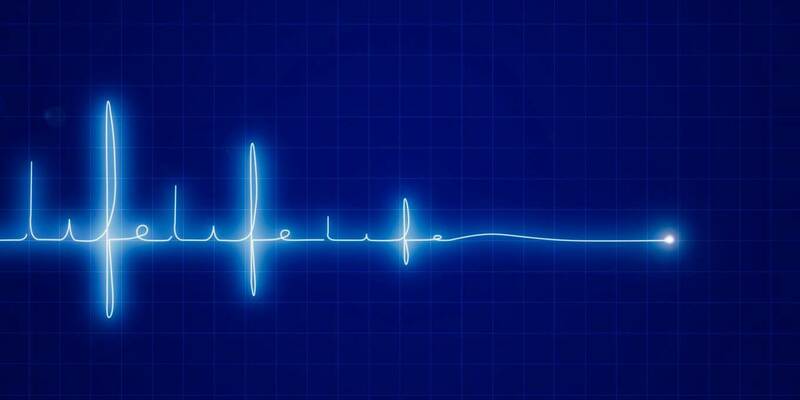 Health care costs have long been rising at a faster clip than those of other goods and services, Sinclair noted. Will Long-term Growth Pan Out? The Treasury Department says recent tax cuts will deliver the promised economic growth. It pointed to low unemployment rates and increased business optimism among other measures to claim that the Tax Cuts and Jobs Act is working out well. “This administration clearly prioritizes long-term growth, and they will say this is an investment in the future … and that it will give us [higher] tax revenues,” said Gomes. “[However], the evidence on that is very questionable at the moment.” U.S. economic growth will likely ease to 2.4% in 2019 after a strong year in 2018 with about 3% growth, according to the Federal Reserve Bank of St. Louis. A decade after the 2008 financial crisis, faith in markets' self-regulating abilities once again lies in tatters. There simply is no single real interest rate that would spur investors to funnel all existing savings into productive investments, and employers to hire all who wish to work at the prevailing wage. ATHENS – When the Great Depression followed the 1929 stock-market crash, almost everyone acknowledged that capitalism was unstable, unreliable, and prone to stagnation. In the decades that followed, however, that perception changed. Capitalism’s postwar revival, and especially the post-Cold War rush to financialized globalization, resurrected faith in markets’ self-regulating abilities. Today, a long decade after the 2008 global financial crisis, this touching faith once again lies in tatters as capitalism’s natural tendency toward stagnation reasserts itself. The rise of the racist right, the fragmentation of the political center, and mounting geopolitical tensions are mere symptoms of capitalism’s miasma. A balanced capitalist economy requires a magic number, in the form of the prevailing real (inflation-adjusted) interest rate. It is magic because it must kill two very different birds, flying in two very different skies, with a single stone. First, it must balance employers’ demand for waged labor with the available labor supply. Second, it must equalize savings and investment. If the prevailing real interest rate fails to balance the labor market, we end up with unemployment, precariousness, wasted human potential, and poverty. If it fails to bring investment up to the level of savings, deflation sets in and feeds back into even lower investment. It takes a heroic disposition to assume that this magic number exists or that, even if it does, our collective endeavors will result in an actual real interest rate close to it. How do free marketeers convince themselves that there exists a single real interest rate (say, 2%) that would inspire investors to funnel all existing savings into productive investments and spur employers to hire everyone who wishes to work at the prevailing wage? Faith in capitalism’s capacity to generate this magic number stems from a truism. Milton Friedman liked to say that if a commodity is not scarce, then it has no value and its price must be zero. Thus, if its price is not zero, it must be scarce and, therefore, there must be a price at which no units of that commodity will be left unsold. Similarly, if the prevailing wage is not zero, all those who want to work for that wage will find a job. Applying the same logic to savings, to the extent that money can fund the production of machines that will produce valuable gadgets, there must be a low enough interest rate at which someone will borrow all available savings profitably to build these machines. By definition, concluded Friedman, the real interest rate settles down, quite automatically, to the magic level that eliminates both unemployment and excess savings. Europe’s current situation demonstrates amply the non-existence of the magical real interest rate. The EU’s financial system is holding up to €3 trillion ($3.4 trillion) of savings that refuse to be invested productively, even though the European Central Bank’s deposit interest rate is -0.4%. Meanwhile, the European Union’s current-account surplus in 2018 amounted to a gargantuan $450 billion. For the euro’s exchange rate to weaken enough to eliminate the current-account surplus, while also clearing the savings glut, the ECB’s interest rate must fall to at least -5%, a number that would destroy Europe’s banks and pension funds in the blink of an eye. Setting aside the magical interest rate’s non-existence, capitalism’s natural tendency to stagnation also reflects the failure of money markets to adjust. Free marketeers assume that all prices magically adjust until they reflect commodities’ relative scarcity. In reality, they do not. When investors learn that the Federal Reserve or the ECB is thinking of reversing its earlier intention to increase interest rates, they worry that the decision reflects a gloomy outlook regarding overall demand. So, rather than boosting investment, they reduce it. Instead of investing, they embark on more mergers and acquisitions, which strengthen the technostucture’s capacity to fix prices, lower wages, and spend their cash buying up their companies’ own shares to boost their bonuses. Consequently, excess savings increase further and prices fail to reflect relative scarcity or, to be more precise, the only scarcity that prices, wages, and interest rates end up reflecting is the scarcity of aggregate demand for goods, labor, and savings. Similarly, today’s free marketeers attribute the failure of inflation to rise, despite wage growth and low unemployment, to a new normal – a new “natural” inflation rate. With their Panglossian blinders, whatever they observe is assumed to be the most natural outcome in the most natural of all possible economic systems. But capitalism has only one natural tendency: stagnation. Like all tendencies, it is possible to overcome by means of stimuli. One is exuberant financialization, which produces tremendous medium-term growth at the expense of long-term heartache. The other is the more sustainable tonic injected and managed by a surplus-recycling political mechanism, such as during the WWII-era economy or its postwar extension, the Bretton Woods system. But at a time when politics is as broken as financialization, the world has never needed a post-capitalist vision more. Perhaps the greatest contribution of the automation that currently adds to our stagnation woes will be to inspire such a visión. Yanis Varoufakis, a former finance minister of Greece, is Professor of Economics at the University of Athens.